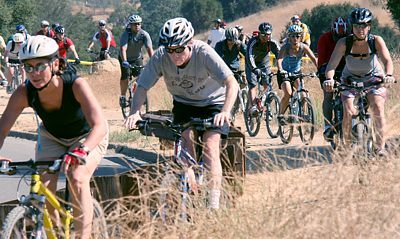 The next Beginners ride will be from de Anza Park in Calabasas through Malibu Creek State Park, past the M*A*S*H site to the dam at Malibu Lake on Sunday April 7. Details and sign-up. 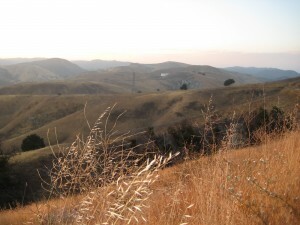 There will be a second and brand new Beginners ride on Sunday April 28 from Las Virgenes Canyon to Cheeseboro Canyon. Details and sign-up. Conejo Spring Trailwork Day Report from March 23. About 60 volunteers helped with the annual Spring Trailwork Day, including nine with CORBA. The work consisted mostly of knocking down a low berm at the side of the road so rainwater can run off, and building drainages to help channel the water off. The CORBA crew was also assigned the task of blocking off the top of a very steep and loose road that had been chewed into the hillside by illegal 4×4 vehicle use. After the work was finished, COSCA (Conejo Open Space Conservation Agency) rangers barbecued up a lunch of hot dogs, beef- and vegie-burgers, with all the typical condiments, chips, fruit and ice-cold drinks. A real bonus was something you rarely see these days – ripe tomatoes! 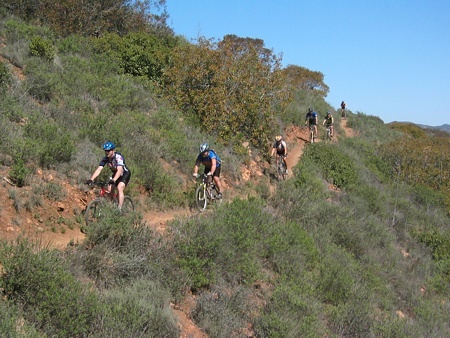 April 19-21: 2013 Santa Monica Mtns Trail Days at Sycamore Canyon. 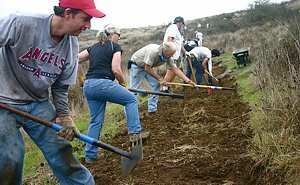 Once a year we have an opportunity to work on the trails and then BBQ and camp at Danielson Ranch in Pt Mugu State Park. It is opened annually for the Santa Monica Mountains Trail Days! This is a unique opportunity to work on the trails that we enjoy so much in Sycamore Canyon, and the event is followed by a BBQ and prize giveaway, with an option for free camping on Friday and/or Saturday night. This is hands down the best day to get in some trail maintenance work! The main workday will be Saturday and there is a smaller one on Sunday. Registration by April 17th will be appreciated so we have enough time to prepare! May 11: Guadalasca Trail, Point Mugu State Park. Details will be forthcoming. October 20th: SAVE THE DATE! This is the main, annual GGR event at Malibu Creek State Park! Back by VERY popular demand is the beginner skills clinic! The GGR event is a FREE event! We will also be having a CORBA/IMBA membership drive, raffles, silent auctions, 4 levels of XC rides, and of course the famous swap meet! Cycle World Chatsworth: http://cycleworldbikes.com/, will be back for their 3rd GGR event for ride support and offer light bike repairs before and after the rides. Saturday April 6 is the next skills clinic.